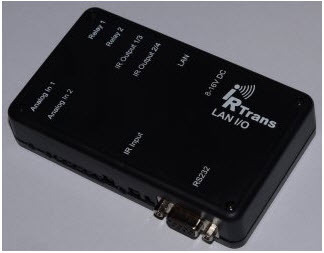 Ethernet Interface to connect to LANs. Integrated web server for device configuration. Supports (not included) one wire sensor (Maxim Semiconductor) : DS1820B and DS18S20 temperature sensors to be connected to any of analogue inputs. Integrated 128K Flash IR database. Connectors for 2 external IR Transmitters (3,5mm plug). 3 IR Receiver integrated (455kHz, 38 kHz and Universal learning). Universal IR receiver. Learns and measures ALL Carrier frequencies. Range: 1m. Connectors for external IR receiver.